Opens office and Nikon School in Delhi. Nikon India announced the opening of their branch office in New Delhi, as part of the company's continued geographic expansion across key markets in India. The new office was inaugurated by Hiroshi Takashina, Managing Director, Nikon India along with Shizuo Shimizu, General Manager- Quality Assurance Department, Hiroshi Masumoto, Manager- Service Planning, Quality Assurance Department and Takehiko Ogasahara, General Manager- International Customer Support Division, Nikon Hong Kong. The Delhi branch office, located at Pusa Road is Nikon's fifth office to be opened in India after those in Kolkata, Bangalore, Mumbai and Head office in Gurgaon. 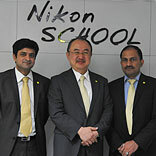 The company also aims to use this office to expand the reach of Nikon School in India. Nikon School is an initiative to impart skills to photography enthusiasts by providing tips, expert guidance and insights about photography.